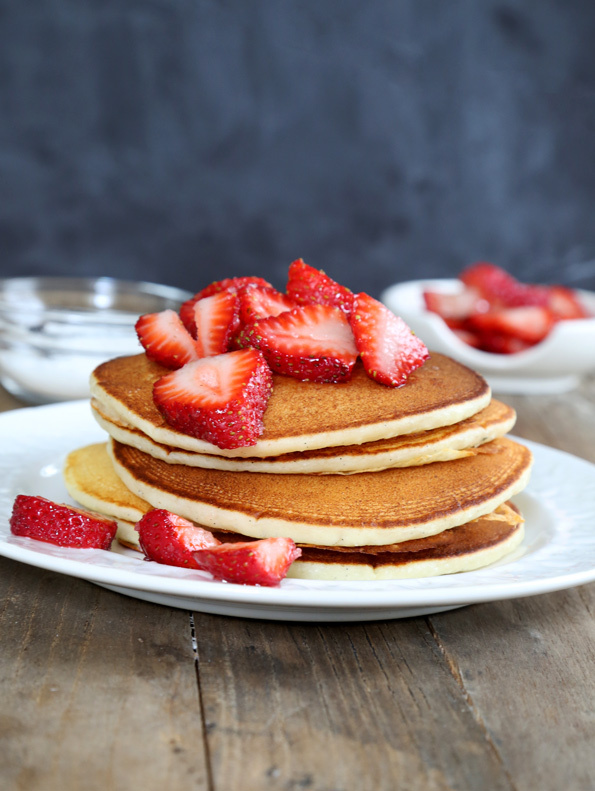 Gluten Free Vanilla Bean Ricotta Pancakes | Great gluten free recipes for every occasion. Light, fluffy, deeply vanilla, probably low-carb, definitely low-sugar gluten free ricotta pancakes. You might never make “plain” pancakes again! If a recipe for 12 generous gluten free ricotta pancakes has only 2/3 cup (8 grams per pancake) of flour and 1/4 cup of sugar (4 grams per pancake), it probably qualifies as low carb, right? I honestly don’t know, though. The ricotta pancakes on page 67 of my first cookbook has always been one of my favorite recipes ever. Every time I make them, I think, wow, these are so light and fluffy, and they really must be low carb and isn’t that nice. But … that’s as far as I ever get. Recently I started playing around with the recipe from the book (one I know from emails over the years is also a reader favorite! yay! ), and found that it works even better with my basic gum-free gluten free flour blend. So ridiculously light and fluffy! And the batter is so easy to pour, too, which makes the actual pancake cooking a dream. Instead of the subtle lemon flavor from the lemon zest that the original recipe calls for, I added 2 teaspoons of vanilla extract plus the seeds from half a vanilla bean (I buy vanilla beans pretty cheap in bulk online and keep them stored in rum, which I occasionally use as homemade vanilla extract but mostly just use to store the beans and keep them from drying out or going bad). The result? Light, fluffy, deeply vanilla, probably low-carb, definitely low-sugar gluten free ricotta pancakes. In a large bowl, place the flour blend, sugar and baking powder, and whisk to combine. In a separate small bowl, place the eggs, vanilla seeds, ricotta cheese, milk and vanilla extract, and beat to combine well. Create a well in the center of the dry ingredients and add wet ingredients, and beat until smooth. The batter should be pourable. Heat a griddle or lightly greased nonstick or cast iron skillet over medium heat. Grease it lightly, and pour as many portions of about ¼ cup of batter onto the hot griddle as can fit comfortably, without touching. 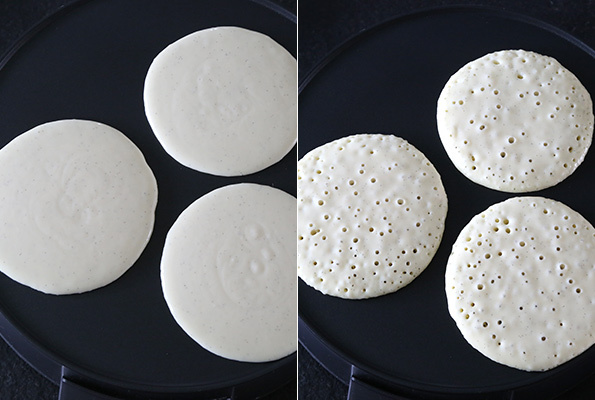 Allow to cook until large bubbles begin to break through the top of the batter in each pancake and the edges are set (about 1 ½ minutes). With a wide, flat spatula, carefully flip over each pancake, and continue to cook until set (about another 2 minutes). Remove from the skillet, and repeat with the remaining batter. Adapted from Ricotta Pancakes on page 67 of Gluten Free on a Shoestring: 125 Easy Recipes for Eating Well on the Cheap (2011). Do you think the protein in cows’ milk is important here, or could a nut milk be substituted? Have you tried freezing them? I am a huge pancakes’ fan, have missed them terribly, and am enormously excited to have found one that sounds this fluffy and delicious! You can definitely freeze these, Beth. I think almond milk would work just fine, but I haven’t tried it so I can’t absolutely promise. It’s definitely worth a try! How did I miss these??? I have been a bit busy lately and have been a slacker in regard to baking. I have been lurking though and this got me. I love when you revisit old recipes. These are now on the list for this week. Thanks! myfitnesspal.com has a nice recipe importer. you can just type in the url and it helps match the ingredients. these look delicious! making them now! Liz, what do you think about this http://happyforks.com/analyzer ? Did you try this tool? Haven’t used that one, I’ll try it next time! Hey I clicked on that happyforks link myself, and it looks great. I love that it at least finds all the ingredients for you that it can. You’ll definitely have to plug in the flour blends individually, but it’s nice to have some of it done for you. Thanks for the recommendation! Update: they were amazing! I am eagerly looking forward to Sunday when I’ll make them again! Hello there the cherished one! I wish to declare that this article rocks !, great composed accessible along with around virtually all substantial infos. I want to notice more content like that . Oh, how did I miss this from the 1st book? Your updated recipe above has me salivating right now! Breakfast for dinner? Have ricotta in the fridge. Unfortunately, I do not have vanilla bean. Do I add a little extra pure vanilla extract in its place if I want to eat this tonight, along with some beautiful gluten free bacon? And I did not add extra extract, just what the recipe called for. 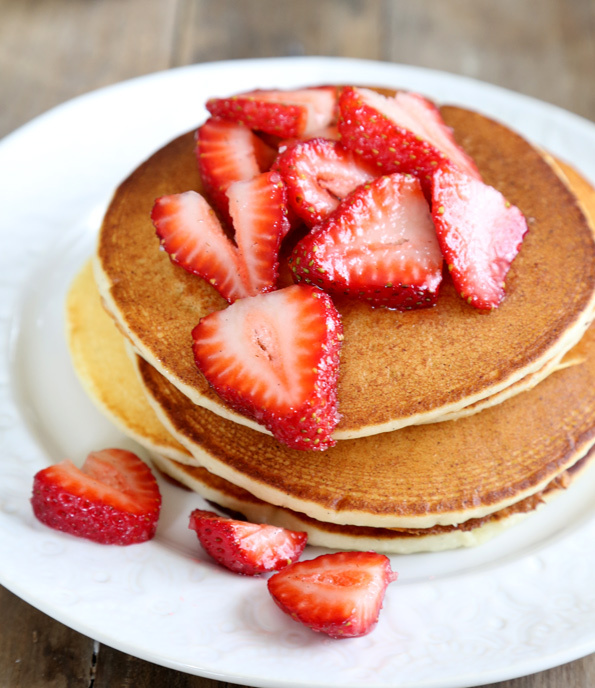 Oh my…my new favorite pancakes, for sure! How did I miss this recipe? I obviously need to spend some time going back through the first book… I remember being overwhelmed by all of the wonderful possibilities when I got the book, and I must have overlooked this one. I am going to make these this weekend- my family will be thrilled! Thanks! And while we are discussing fabulous breakfast food, have you ever thought about making yeast-raised pancakes, or are they even a thing? I love, love the yeast-raised waffles from the bread book, but I know pancake and waffle recipes are slightly different. The waffle batter always seems too thick to use for pancakes. All of the fabulous berries and stone fruit are done around here, so we are left with melons and grapes, but maybe they would be good with apples in a month or so? I made these this morning, and they are so fluffy and delicious! They may replace your badic xg- free recipe as my regular pancake re ipe. Yum! Yeast-raised pancakes are definitely a thing, Michelle! They are very, very similar to waffles, but yes, the batter is thinner. I should do a blog recipe like that. Great idea, as always! I love summer fruits, but I’m so ready to bake with apples, as we’re in kind of a fruit dead zone, now (melons don’t really count!). Why have I never made these before? So strange since we eat pancakes all the time around here. I’m going to put them on my menu!